A man's appearance precedes his words. His colleagues and superiors will "peg" him as a professional on his way to success, or as just a regular guy, or as a slob. The perceived quality of a man's work may differ according to his appearance. Here are tips for men to dress professionally. Buy one suit in a quality fabric rather than three cheap suits in different colors. The quality of the fabric is more important than the cut of the collar. 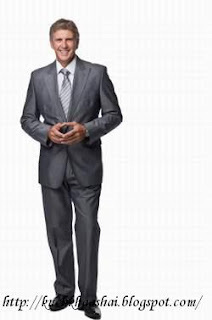 Someone wearing a polyester suit will not be considered as successful as a man wearing a silk or wool suit. Men's styles do not change much from year to year. It is common for a man to wear the same suit for several years, so pay for a quality fabric. Purchase a navy suit first. Both men and women perceive navy to be the color of success. The second suit purchased should be gray and the third should be black. After those three suits are purchased, then fill out your wardrobe with colors of your choice. If you want other people to focus on your knowledge, skills, and professional demeanor, then wear conservative solid shirts such as white or blue. Bright colors and loud designs will bring attention to your clothing instead of your projects. Buy silk ties as part of your professional attire. They will last a lifetime with proper care. Choose either solids or subtle designs. Choose dress socks which match your slacks. They should be at least calf length so that only the socks are seen when sitting. Shoes are a very important part of dressing professionally. Buy the lace-up style and polish them regularly. A nice suit with a scuffed pair of loafers will down-grade your entire appearance. Choose a good quality leather shoe for comfort and years of wear. Buy your belts at the same time that you purchase your shoes. Belts should be leather and should match the color of the shoes. Belt buckles should be conservative. Wear gold jewelry and a quality conservative watch. There should only be one ring on each hand, perhaps the class ring and a wedding band. Have your teeth cleaned at least once a year, preferably every six months. Get regular haircuts instead of waiting until your hair looks like it needs to be cut. Practice impeccable personal hygiene. Keep your hands clean (no nicotine stains) and your finger nails manicured. The condition of your hands and finger nails says a lot about your personal cleanliness. Men who dress professionally are perceived as being successful. This will give you an edge over men who do not present a professional image. Scroll down to the Resources section for more information on getting ahead at work and dressing professionally on a budget.